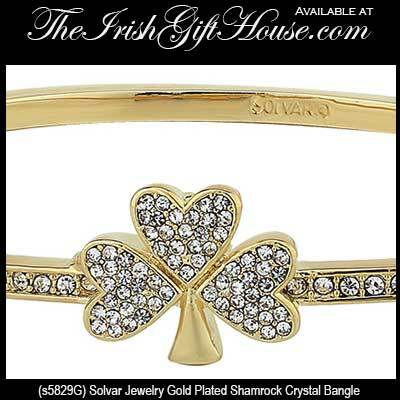 This gold plated shamrock bracelet is a hinged bangle that features a crystal studded design that includes crystals set in the front half of the bracelet. The locking bangle features a 5/8" wide x 1/2" tall shamrock along with a 1/8" wide shank; it is a suitable size for most women's wrists. Shamrock bracelet is a hinged bangle design that features Connemara marble leaves.